While not as easy to find as chicken eggs, turkey eggs -- more commonly used to yield more turkeys than sold for consumption, explains Ohio State University -- can make up part of a balanced diet. At 135 calories per egg, turkey eggs provide fuel as well as essential nutrients. Turkey eggs also boost your saturated fat intake, however, and they're extremely high in cholesterol, so you should consume them in moderation. Most of the calories in turkey eggs come from fat. Each egg contains 9.4 grams of total fat, which contributes 63 percent toward the eggs' total calorie content. This fat provides energy to fuel a healthy and active lifestyle, serves as a source of fatty acids needed for healthy cell membranes and also helps you absorb nutrients. Turkey eggs each contain 10.8 grams of protein, which accounts for 32 percent of their calorie content. Protein maintains your immune system, promotes new tissue growth and helps your body hold on to muscle mass. Turkey eggs are low in carbohydrates, at less than a gram of carbs per egg. Turkey eggs come loaded with minerals, especially selenium and iron. Your body incorporates iron into heme -- a component of proteins responsible for oxygen storage and transport -- and uses it to support immune function. Each turkey egg provides 3.24 milligrams of iron, which is 18 percent and 41 percent of the recommended daily intakes for women and men, respectively. The selenium in turkey eggs promotes healthy cell growth and aids in thyroid function. Eating a turkey egg boosts your selenium intake by 27.1 micrograms, providing half your recommended daily intake. Consume turkey eggs as a source of vitamins, especially vitamins B-9 and B-12. Both vitamins help you make red blood cells, a process essential for healthy oxygen transport. Vitamin B-9, also called folate, also promotes healthy fetal development, while low B-9 levels can lead to neurological birth defects. Vitamin B-12, or cobalamin, supports nerve function and might help lower cancer risk, notes the Linus Pauling Institute. A turkey egg contains 56 micrograms of vitamin B-9 -- 14 percent of the recommended daily intake -- as well as 1.34 micrograms of vitamin B-12, or 56 percent of your daily B-12 intake requirement. 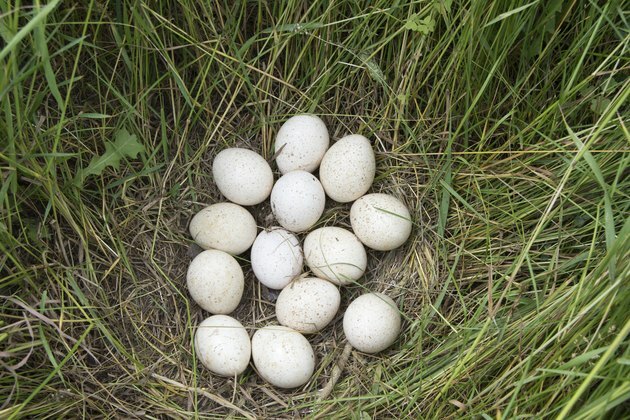 Turkey eggs also have some major nutritional disadvantages because of their lipid content. Each egg contains 2.9 grams of saturated fatty acids, as well as a whopping 737 milligrams of cholesterol. This is more than twice the daily recommended cholesterol limit outlined by the American Heart Association and 13 percent of the recommended daily saturated fat limit, or more than three times your cholesterol limit and 18 percent of your saturated fat limit if you have high cholesterol or heart disease. Eating foods high in cholesterol and saturated fat negatively affects your blood lipid levels and increases the harmful cholesterol in your bloodstream. Eat turkey eggs as an occasional treat, and talk to your doctor before consuming them if you're at risk of cardiovascular disease. How Many Calories are in a Scotch Egg?